“Bestwood Pharma” is one of the leading Russian manufacturers of specialized products for a treatment of and preventive measures for chronic skin diseases, and preventive diet nutrition products. Russian Federation distributors are the leading national pharmaceutical companies, such as – Katren, Ptotek, Amma, Medeksport, etc. Retail Sales: over 70 largest pharmaceutical networks, over 40 000 pharmacies. External market representatives: Belarus, Ukraine, Kazakhstan, Georgia. Recommended by the leading dermatologists of Russia. First Moscow State Medical University n.a. I. M. Sechenov and other leading Moscow medical centers. 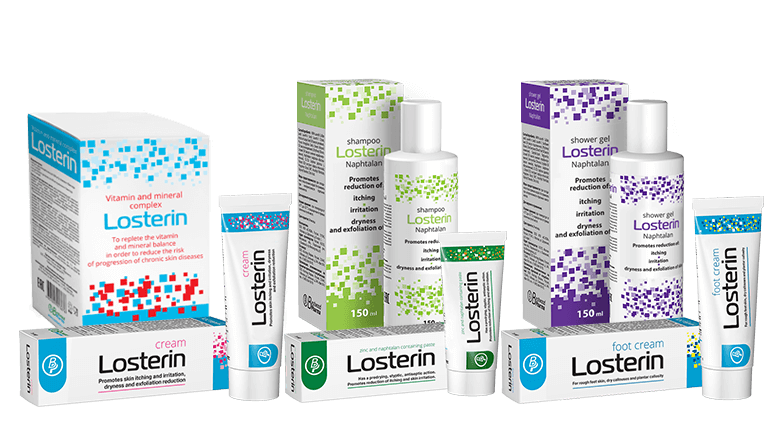 Losterin medications line contains a balanced combination of active ingredients, especially selected for the most therapeutically effective treatment for different skin diseases. , 75 ml, – with a very strong antibacterial, antipruritic, exfoliating and antimicrobic action, promotes the restorations of the affected skin, improves regeneration and prorotection skin functions, prevents the feeling of dryness and irritation. , 75 ml, – contains the same active ingredients as the classic “Losterin” cream. 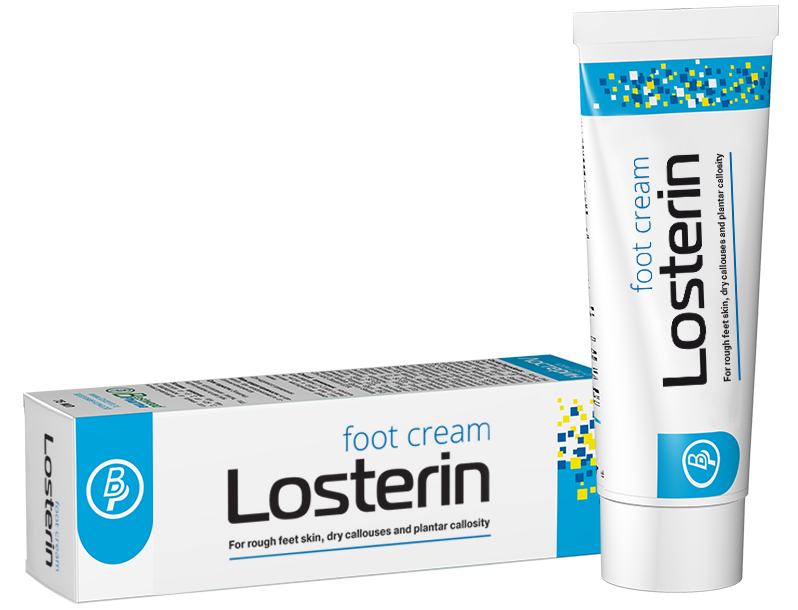 However, in contrast with the cream, the emulsion “Losterin” has a thicker and oiler base, gets absorbed by the skin slower, goes deeper into the skin and is characterized by a longer action. It is effective for treating psoriasis (in the decrement stage), eczema, neurodermatitis, atopic dermatitis, contact dermatitis, lichen planus, ichthyosis, xerosis and other skin diseases. , 150 ml, – for a daily care of your scalp and hair and fighting seborrhea (dandruff), psoriasis, furunculosis, mycosis (Tinea capitis), and also for impaired skin barrier function, scalp skin dryness and irritation. 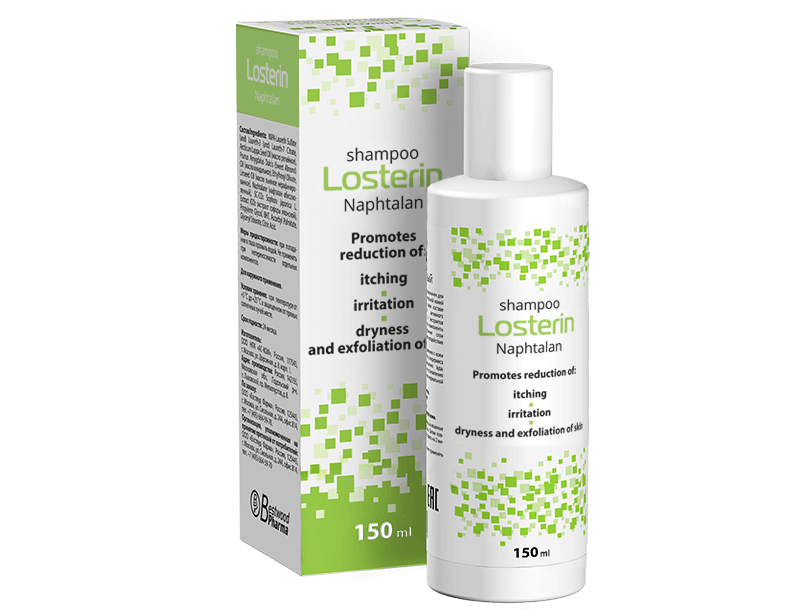 Losterin shampoo ingredients provide antipruritic, antifungal and antimicrobial action, promote regeneration and strengthening of hair structure. , 150 ml, – may be used daily for dry, irritated skin care and for different skin diseases. Contains a complex of active ingredients, which are effective in reducing an inflammation, itchiness and sloughing of skin, moisturize and promote damaged skin regeneration. , 150 ml, – is a non-hormone medication for daily skin care in case of various forms of “dry” dermatoses, e.g., psoriasis, eczema, atopic dermatitis, seborrheic dermatitis, contact dermatitis, lichen planus, ichthyosis and xerosis. 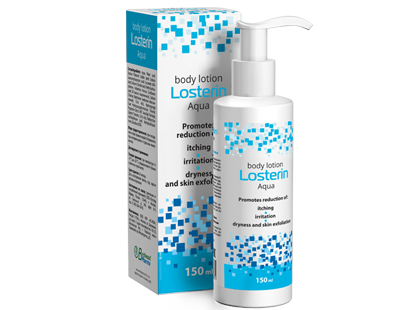 The ingredients of “Losterin Aqua” lotion have significant anti-inflammatory, antipruritic and antimicrobal actions, promote the restoration of affected skin, enhance the regenerative and barrier functions of the skin and prevent dryness and irritation. , 50 ml, – is used in a complex therapy of various skin diseases exacerbation, accompanying by oozing: moist eczema, atopic dermatitis, allergic contact dermatitis, seborrheic dermatitis, psoriasis exudative, lichen simplex chronicus, pyoderma, trophic ulcer, erysipelas, intertrigos). 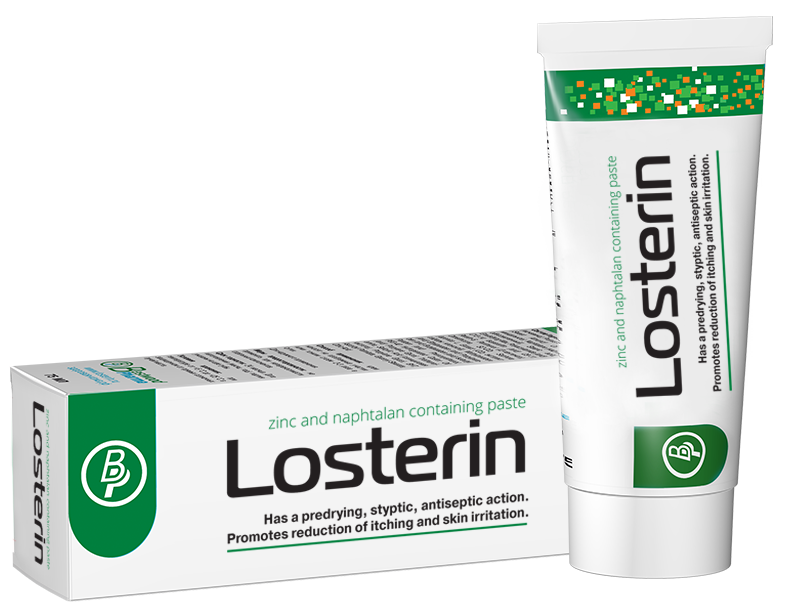 “Losterin” zinc-naphtalan paste has a sugnifficant anti-inflammatory, adsorptive, astriction, drying, anti-itching, antiseptic and disinfectant action. , 150 ml, – may be used in a complex care of various diseases accompanied by severe hand skin dryness: eczema, psoriasis, xerosis, atopic dermatitis, contact dermatitis, ichthyosis, keratodermia (different forms), pityriasis rubra pilaris. Cream- soap active ingredients (naphtalan, seed oil, etc.) provide a comprehensive therapeutic effect: geantly cleansing and moisturizing hand skin, reducing inflammation, itching and irritation, has antibacterial and regenerating action. , 75 ml, – may be used for daily care for dry, rough feet skin, planar psoriasis, dry callus, plantar callosity, foot skin damage, cracks and persistent erosions. Effective for itching, flaking foot skin, increased sweating, appearance of unpleasent odor, dermatomycosis (in a combination with a basic therapy). 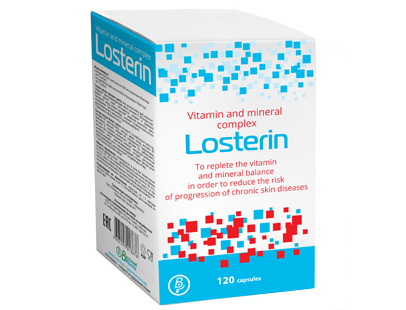 Vitamin and mineral complex "Losterin"
developed for vitamin and mineral balance supplement to prevent the development of the chronic diseases: Psoriasis, Seborrhea Dermatitis, Xerodermia, Keratodermia, Ichtyosis. A daily dose of vitamin and mineral complex “Losterin” contains 10 essential vitamins combined with minerals, polyunsaturated omega-3 fatty acids and beta-carotene. The formula also includes silymarin, which has an intense hepatoprotective effect and provides the comprehensive protection of liver cells. 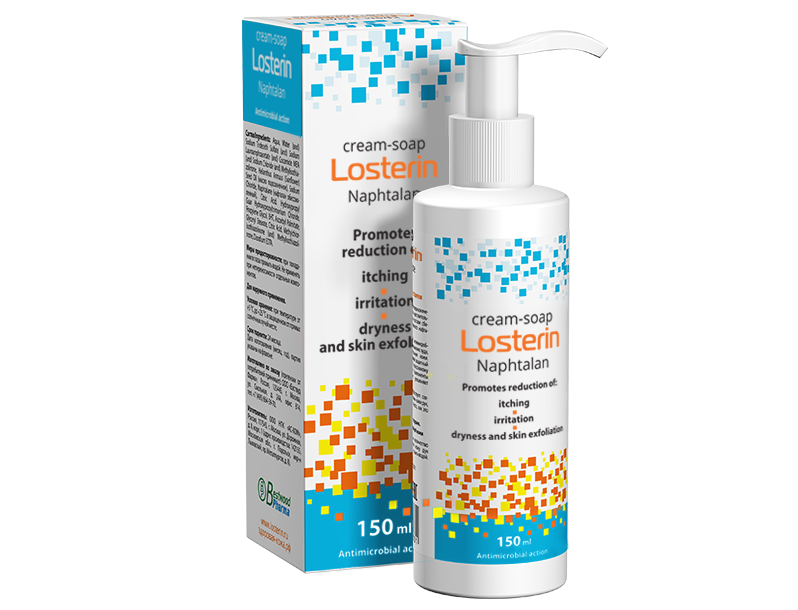 Combination of Losterin line products and a basic therapy allows to achieve a maximum effect in a complex therapy of chronic skin diseases treatment. 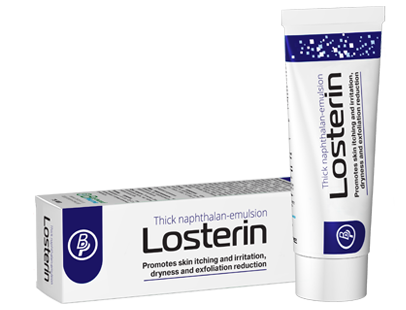 High quality control standards at all production stages of Losterin products provide its high clinical effectiveness, reliability and safety. Study results: The study has proven, that Losterin medications are effective products of external application for a complex treatment of psoriasis. Having anti-inflammatory, regenerating, moisturizing effect, normalizing the local microcirculation, it has a positive effect on all pathogen aspects of the disease, leading to a clinical effect. An absolute safety of Losterin products allows its usage for a support of clinical remission within a long period of time. The birthplaces of naphtalan are small wells, located near Baku – the capital of Azerbaidzhan. Due to its origin, it was named – the blood of the Earth. Later on, a city called Naphtalan was based there. Back in 13th century a traveller Marco Polo mentioned in his notes a healing dark oil, found on this territory. Merchants often came to this region, in order to take an advantage of the oil’s healing power. They took it and brought it home, and later on, started selling it. «Bestwood Pharma» is one of the leading Russian manufacturers of specialized products for a treatment of and preventive measures for chronic skin diseases, and preventive diet nutrition products. • joint advertisement campaign and actions. «Bestwood Pharma» company invites to cooperate partners for «Losterin» brand products distribution organization at external markets of Europe, Asia, USA. We will be happy have new partners!